Bariatric surgery, or weight-loss surgery, in Canada has jumped four-fold since 2006-07. A new study says the health-care system has made great strides to meet the demand but is still lagging behind, especially in certain parts of the country. Bariatric surgery, or weight loss surgery, in Canada has jumped four-fold since 2006-07 and a new study says the health-care system has made great strides to meet the demand. "One in 5 Canadian adults has obesity — and with those rates continuing to grow, so too will the need to understand the implications for the health-care system," said Kathleen Morris of the Canadian Institute for Health Information (CIHI), which released a report Thursday about the massive surge in bariatric surgeries in the country. The study said 6,000 bariatric surgeries were performed in the country's hospitals in 2012-13 compared with the 1,600 in 2006-07. Eight out of 10 patients are women. Christine Garrison, 46, was told in 2010 that she would have a five- to six-year wait for the surgery. The Nova Scotia woman, who weighs 421 pounds, says she struggles just "to do simple things in life." "The weight would not come off at all no matter what I tried," Garrison told CBC News. "I'm not one of those people who drink pop and chips and chocolate bars." Despite improvements in wait times, demand remains high, especially in Atlantic Canada where resources are struggling to keep up with need. "People who are living on the East Coast may be waiting between five to 10 years," Dr. Yoni Freedhoff told CBC News. Freedhoff is with the Bariatric Medical Institute in Ottawa and contributed to the report. "Whereas in Ontario, they may only have to wait for six months.…We need better access across the board." The report highlights the efforts of the Ontario Bariatric Network, created in 2009. It has four centres of excellence across the province including regional assessment and treatment centres, allowing for more surgeries to occur. But it's a different story in Nova Scotia. "The epidemic is relatively new, so we haven't prepared for it," points out Tom Ransom, an endocrinologist at the Queen Elizabeth Health Science Centre in Halifax. "You need a lot of operating time, room and physicians qualified to do these procedures." Adjustable gastric banding: a flexible band is placed around the upper portion of the stomach. Sleeve gastrectomy: about 80 to 85 per cent of the stomach is removed. 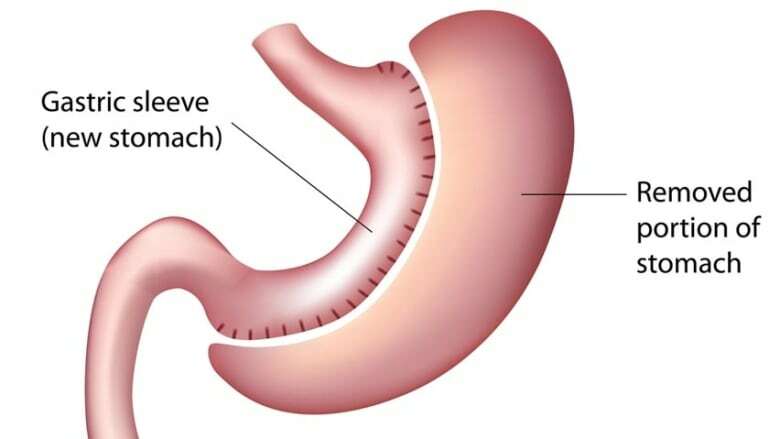 Gastric bypass: the size of the stomach is reduced and a part of the small intestine is bypassed. The CIHI report says the outcomes have been good. Six per cent of patients were readmitted into hospital within 30 days of their procedure. That is down from nine per cent in 2006-07. The rate is also comparable for all surgical patients in Canada. "These procedures absolutely improve people's health and qualities of life," said Freedhoff. A recent study of patients who have done the surgery, conducted by the Cleveland Clinic and published in the New England Journal of Medicine, found improvements in patients with Type 2 diabetes three years after the procedure. The study also found that patients had a reduced need for high blood pressure and cholesterol medicines. "I'd be happy if I lost 50 pounds," said Garrison, who can hardly walk. "After two or three minutes of standing, I get pains in my back and legs.… It'd be a whole new life for me." However, the report contains a few cautionary notes. Mortality rates range from 0.1 to two per cent. In addition, there is a potential of a "wide range of problems after surgery" including ulcers, bowel obstructions, gallstones and excessive scar tissue formations. 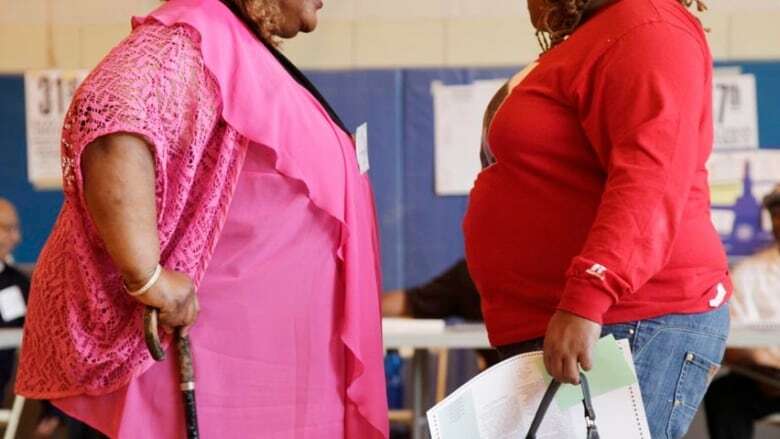 The report also expresses concern about the growing rates of obesity in Canada and the continuing leap in numbers of people who could require bariatric surgery. The cost of the 6,000 bariatric surgeries is tabbed at $48 million. It said that a number of Canadians chose to pay out-of-pocket for the surgery within Canada and outside of the country. A recent study from Memorial University in St. John's predicted that about 21 per cent of Canadian adults will be obese by 2019. Obesity, defined as a BMI of 30 or higher, is associated with health risks such as diabetes, high blood pressure and cancer, with annual costs in Canada between $4.6 billion and $7.1 billion. Normal weight is classified as a BMI of 18.5 to 24.9 while overweight as BMI of 25 to 29.9. In the end, Freedhoff says, there is larger issue at stake: prevention. He says the environment we live in — easy access to sugar-laden foods and lack of exercise — is contributing to the problem. "This world is driving the problem,' said Freedhoff. "We're going to need to change the world we're bringing up our children in."